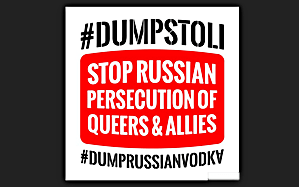 Stolichnaya Vodka – SPI Group has tried everything that it can to stop a boycott of its vodka due to the human rights violations that are happening in Russia and the countries persecution of it’s LGBT citizens. On July 25th, SPI Group released an open letter to the LGBT community that declared it “firmly opposes such attitude and actions” committed by the Russian government and continues to be a “fervent supporter and friend” of the community, pointing to past endorsements of Pride events and LGBT organizations. SPI was also quick to point out that Stolichnaya is not bottled in Russia but in the neighboring Latvia, conveniently leaving out that Stoli is indeed made with Russian bought ingredients. Prior to this week sexual orientation was not included on the About page. While it is commendable for SPI/Stoli to add sexual orientation to its page. It would have been more so it it was always included and also the paragraph fails to mention protections for transgender employees. SPI/Stoli has been spinning this situation hard to stop the backlash against their vodka and have even resorted to playing the “victim”. But the bottom line is despite all that SPI/Stoli still buys its ingredients from Russia thus adding to its economy and thereby supporting its Government. Don’t be fooled. Boycott Stolichnaya!